Now that you know your maki from your nigiri and aji from aayogi, it’s time to take a seat at the sushi table. But what’s the best way to eat this Japanese delicacy? Can you eat it with your fingers? Should wasabi be stirred into the soy sauce or spread directly on the roll? One mouthful or two? Add to this the famed Japanese penchant for fusing form with function, which means the flavor and experience of sushi is influenced not only by how it’s prepared, but also by how you eat it. Suitably challenged? These guidelines will help you thoroughly enjoy your next sushi adventure. 1. Clean your hands: You may be offered hot, wet towel (oshibori) before the meal. This is to clean your hands. NOT your face. 2. 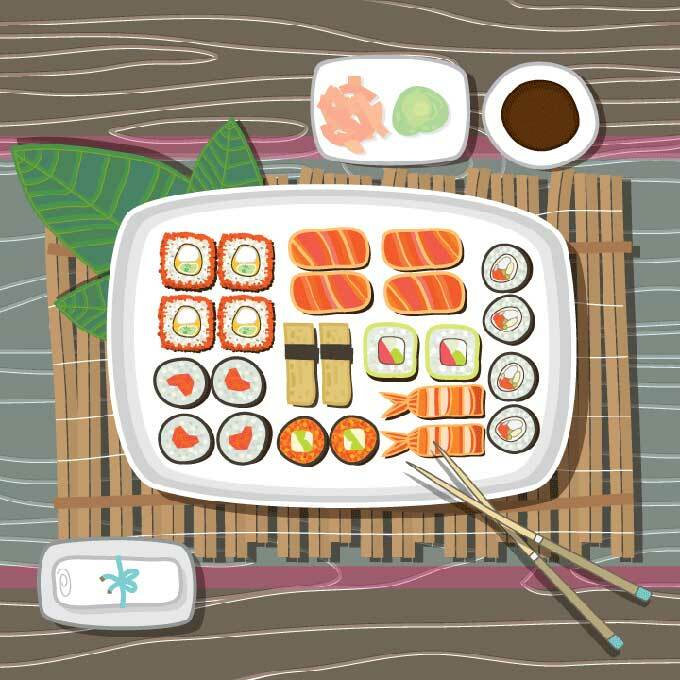 Use your hands: Sushi actually began as finger food. So yes, it’s PERFECTLY all right to eat it with your fingers. In fact, most sushi masters prefer using fingers as this allows you to experience the texture and helps keep everything together. Plus, it is hard to properly dip the fish using chopsticks. 4. Don’t mix the condiments: Aka, don’t pour wasabi into your soy sauce. Wasabi should always be spread directly on the fish. 5. Dip your sushi fish-side first: Turn your sushi upside down, then dip only the fish into your soy sauce – never the rice. Else the rice may soak up too much soy sauce, ruining the balance of flavours. Plus, the molded rice will disintegrate if it’s dipped directly into soy sauce. 6. Do not dip elaborate sushi: If the sushi has a glaze or sauce on top (usually the case with nigiri), do not dip it in the soy sauce, as this will mess up the flavours. 7. Be careful with the wasabi: Dab just a small bit onto your sushi, so you don’t overpower all other flavours. If you are eating nigiri, the chef may have added wasabi between the fish and the rice, so try a piece before adding more. 8. Eat from lightest to darkest: Start with the mildest fish (like flounder) and work towards the heavier tuna. If it’s a platter of different kinds of sushi, begin with nigiri and maki, followed by more elaborate rolls or temaki. The milder flavors come first, so they are not overpowered by the bold flavors. 9. Rice follows fish: Sushi pieces should be placed in the mouth upside down so that the fish lies against your tongue. This allows you to taste the fish more than you taste the rice. 10. Eat the sushi in one bite: Traditionally, each piece of sushi should be eaten in one bite. If you really can’t eat the piece in one bite, hold it with your fingers until you are ready to finish. It is poor etiquette to return a half-eaten piece to the plate. 11. Cleanse your palette with ginger: The ginger is never meant to be eaten in the same bite as the sushi. Instead, use it refresh your mouth between bites, especially between different types of sushi. Think of it as a taste bud reboot! Just a roll of sushi does not a meal make. So, here’s how to pair it with the right beverages and other dishes to create the perfect menu. 1. Starters: Popular pre-sushi starters include miso soup, suimono (clear broth), a mixed salad and edamame (boiled soy beans). 2. Beverages: Typically, experts avoid drinking sake with sushi, since they are both rice-based and may interfere with each other. Green tea, water and a mild beer make the best pairing, while wines and soft drinks will overpower the subtle flavors of sushi. However, this is really a matter of personal taste. 3. Rounding it off: Many sushi restaurants serve agari – green or brown roasted tea – at the end of a meal. Or you could opt for miso soup, which is traditionally enjoyed at the very end of the dining experience.